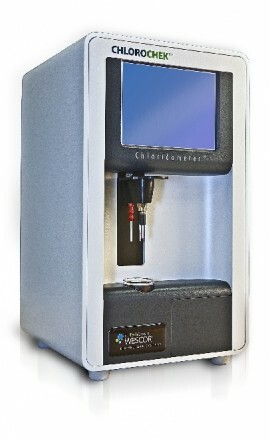 ChloroChek has an intuitive touch-screen interface with simple prompts and leads the operator through the entire process of measuring chloride levels of sweat samples. Electrodes are simple to install and remove for cleaning. Sweat controls are available with 3 levels to insure the highest level of quality control procedures for regulatory requirements. Early diagnosis and treatment can significantly improve both the quality of life and the lifespan of children born with cystic fibrosis. The proven diagnostic effectiveness of analyzing chloride ions in sweat makes it vital to perform this test soon after birth. Wescor, an Elitech Group Company, has long been an innovator in the laboratory diagnosis of cystic fibrosis with the Macroduct Sweat Collection System. The Macroduct System has been approved by the U.S. Cystic Fibrosis Foundation for the stimulation and collection of sweat. The ChloroChek Chloridometer is a perfect diagnostic companion to the Macroduct System. ChloroChek is intended for the quantitative in vitro diagnostic determination of chloride in human sweat using the principle of coulometric titration. Sweat chloride measurements are used in the laboratory diagnosis of cystic fibrosis. 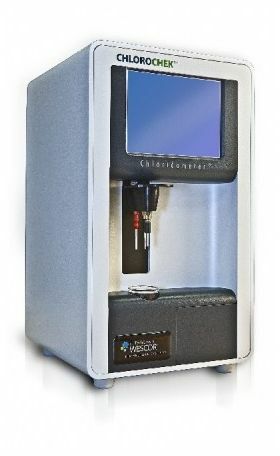 The ChloroChek Chloridometer is a coulometric titrator designed to determine chloride ion concentrations in sweat samples with just 10 microliters of sweat. It displays the concentration directly in mmol/L Chloride. The sweat sample is added to an acid buffer/stabilizer working solution. Silver ions are generated by electrolysis from silver electrodes also immersed in the working solution. The combination of silver ions and chloride ions (from the sweat sample) is a quantitative reaction that is recorded in real time, and is proportional to the chloride ion concentration in the sweat sample. The ChloroChek is truly simple to use and provides consistent results. It performs accurate coulometric chloride titration of small sweat samples – a huge step forward in the laboratory diagnosis of cystic fibrosis in clinical laboratories that demand fast-paced accuracy at an economical cost. Use this form to request a quote for the above product. Please select any relevant product options before submitting. Thank you.